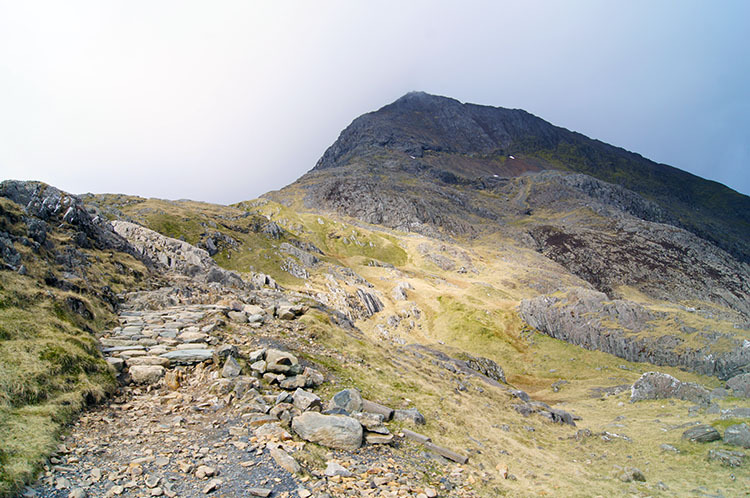 Summary: I had climbed Snowdon once before by following the Miner's Track from Pen y Pass. 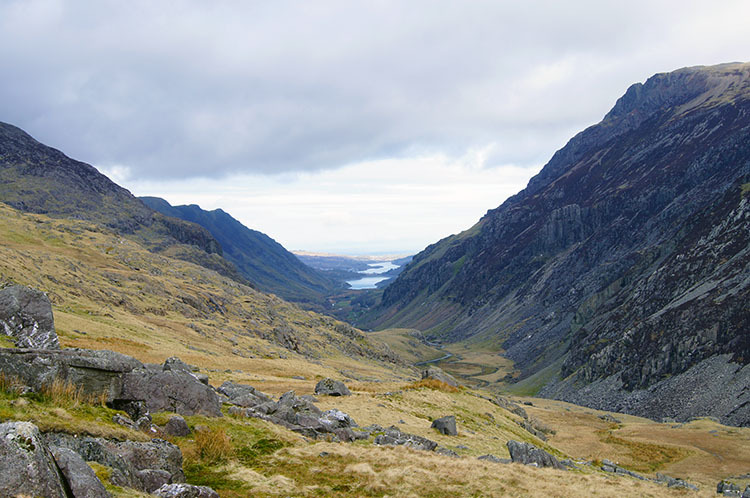 This time I was resolved to climb the mountain by the hardest recognised route, via the serrated ridge of Crib Goch and the pinnacles of Garnedd Ugain. And so I did, in the company of Adam Gallimore during a long walk down the length of upland Wales in 2013. 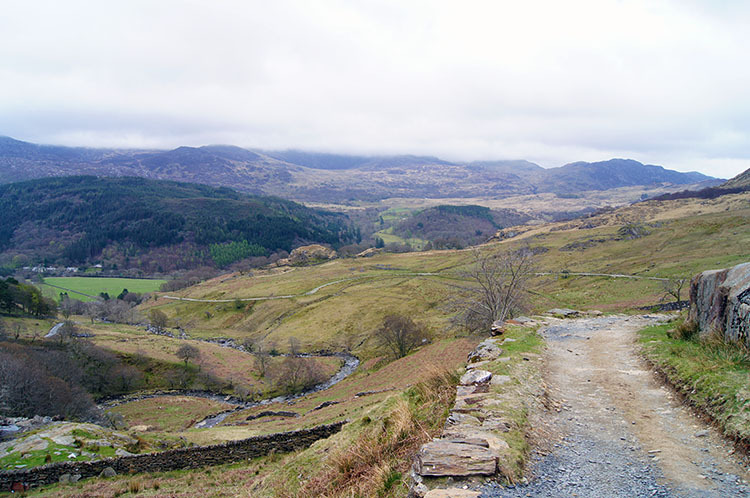 The entire route here from Pen y Pass to a finishing point at Bethania on the A498 was part of that long walk and one of the most memorable. 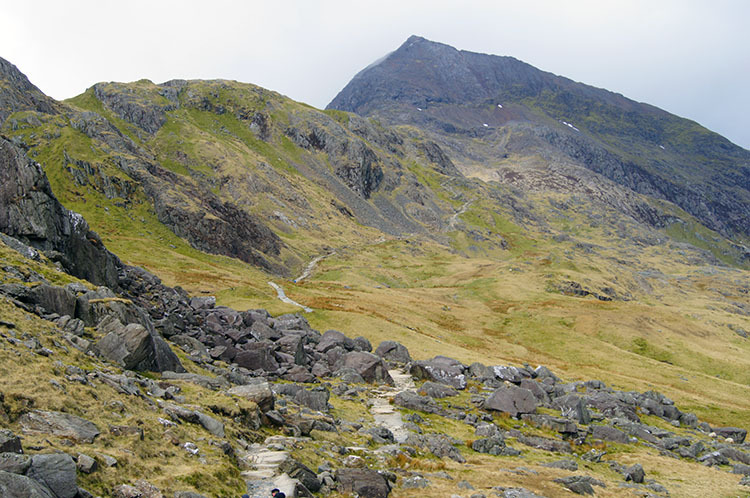 Note: The map and route files available on this page are for the actual Snowdon Horseshoe walk. My actual route is available here. 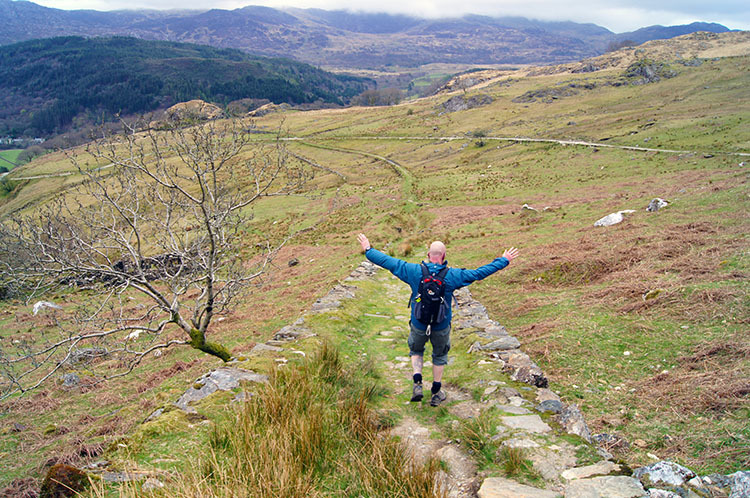 It was an epic walk and is my recommendation for a linear walk across the Snowdon Massif. 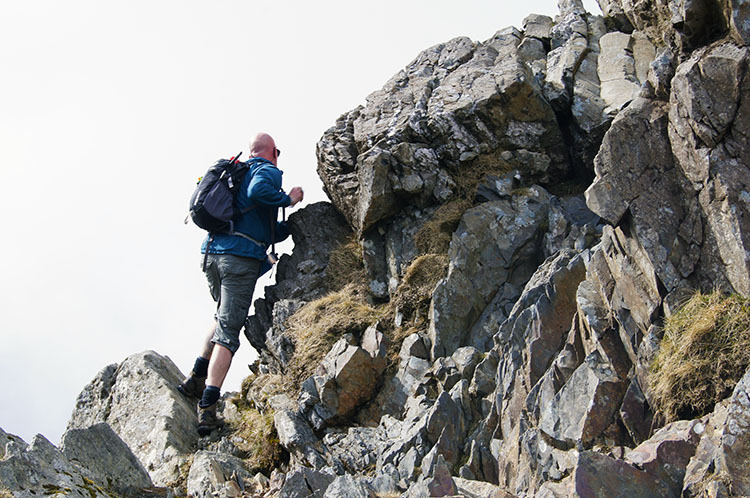 The Walk: Having crossed some of the Lake District's finest ridges including Sharp Edge and Striding Edge and having scrambled up Jack's Rake and Lord's Rake too I have developed an increased sense of adventure since rediscovering hill and mountain walking in the 1990's. And only the day before this one I had scaled up a gully to reach the summit of Tryfan and then leapt the short but exposed gap between Adam and Eve. 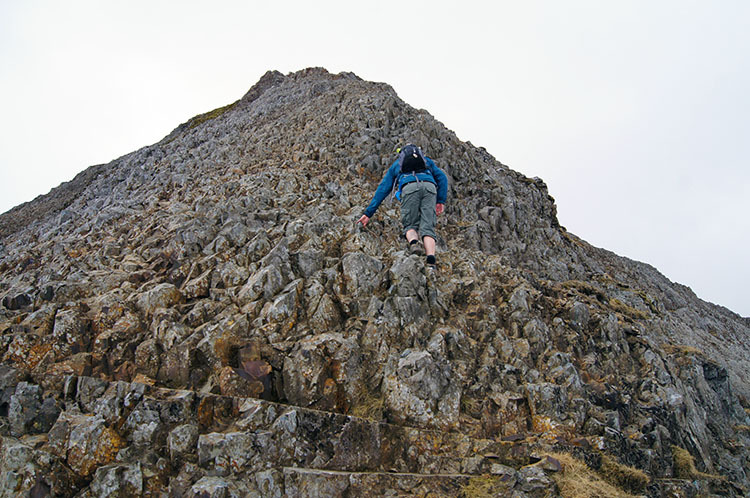 Then after that I scrambled up a gully and across the face of Glyder Fach so I was well up for the challenge that lay immediately ahead - my first scramble up to the ridge and then across Crib Goch. I was joined in my quest by Adam Gallimore who had been across before. After meeting up at 9.00am off we went by following the Pyg Track. The day was set fair and there was the hope of good visibility, not just on crossing Crib Goch but at the summit of Snowdon too. I hoped there would be because on my previous walk up Snowdon some persistent summer cloud had draped itself over the top 100 metres. Holding on to the hope for better this time we pressed on along the well maintained Pyg Track. As we walked the approach path to Crib Goch excellent views of the Pass of Llanberis were provided. 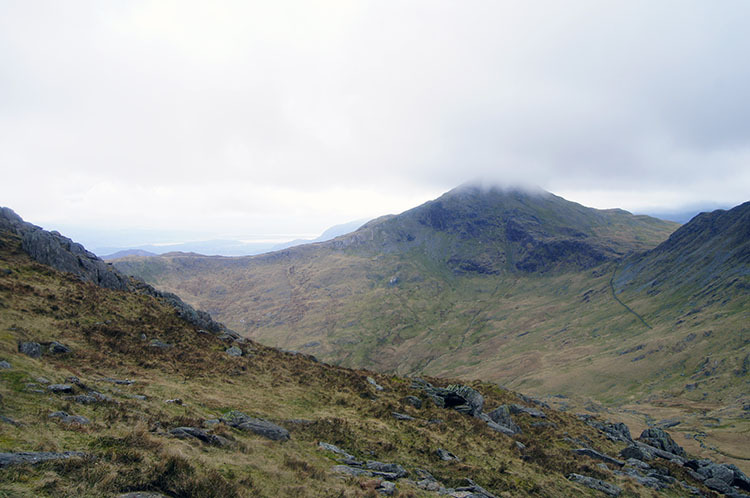 Though high cloud shielded the sun it was perfect for walking and for scrambling to cross an exposed ridge too. 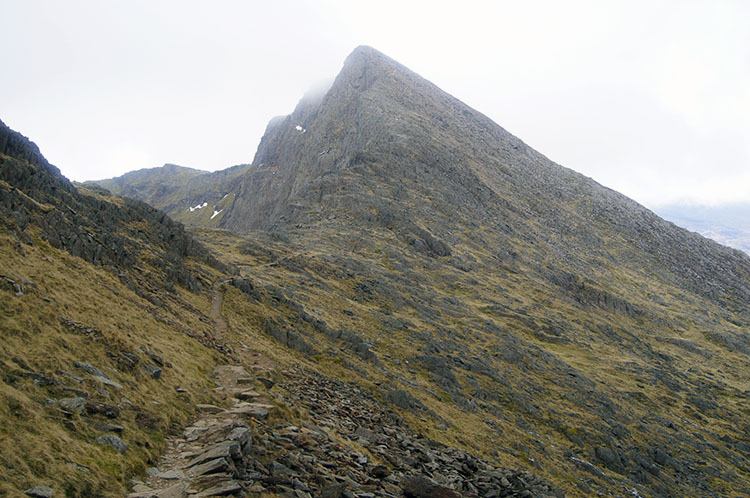 As we continued on and up towards Crib Goch I did think of what lie ahead. How difficult would it really be? 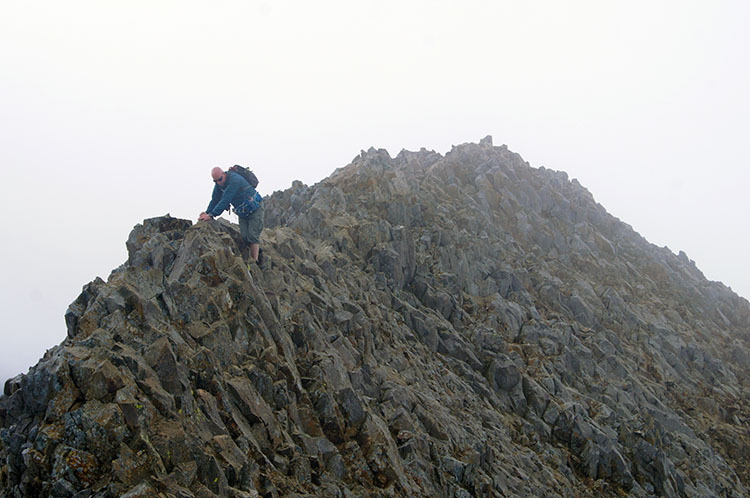 I had been warned Crib Goch was much more challenging than both Sharp Edge and Striding Edge. How much more challenging could it be? 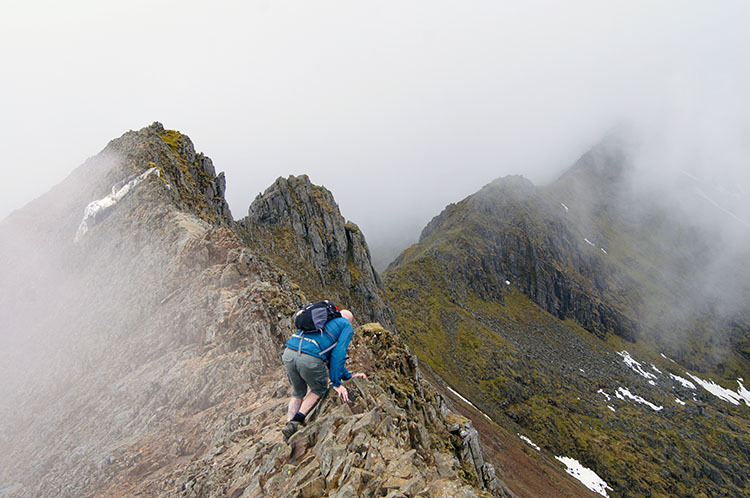 As I had planned we were attempting the classic traverse of Crib Goch from east to west which leads up from the Pyg Track to a "bad step" where hands and feet are both needed briefly. No worry, I had dealt with a few bad steps before. However, what was described as bad step was every bit the challenge I expected and more besides. In fact it was quite 'oh my word' and 'you must be kidding' at times. Now having reached the stile where Adam and I left the Pyg Track I can explain exactly why. The first indication of the difficulty that was directly ahead was a sign with red background and bold white lettering. 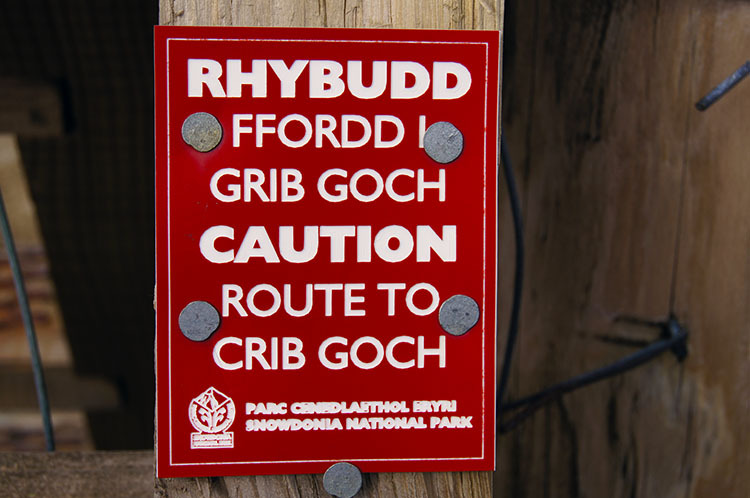 The key word was 'CAUTION' followed by 'ROUTE TO CRIB GOCH'. e had well and truly been warned. 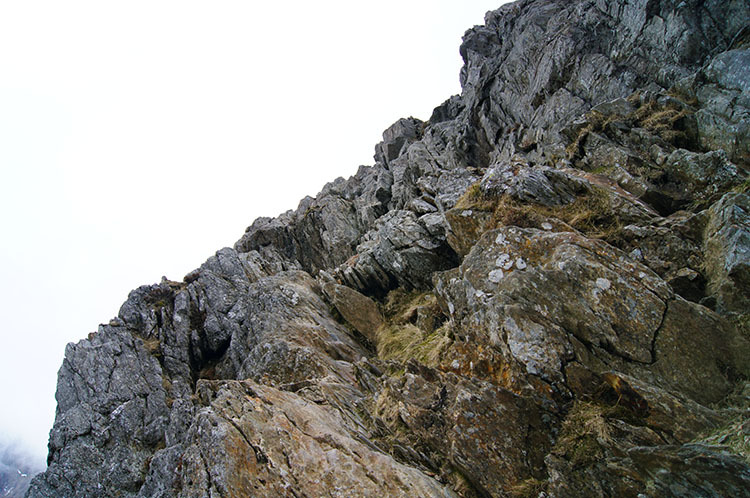 Looking up to the east face of Crib Goch I could see a steepening picture. And more appropriately I could not see a clear path. Taking time for a breather before taking on the challenge I looked back along the Pyg Track from where we had came. There was no going back for us though. Where is the path now? 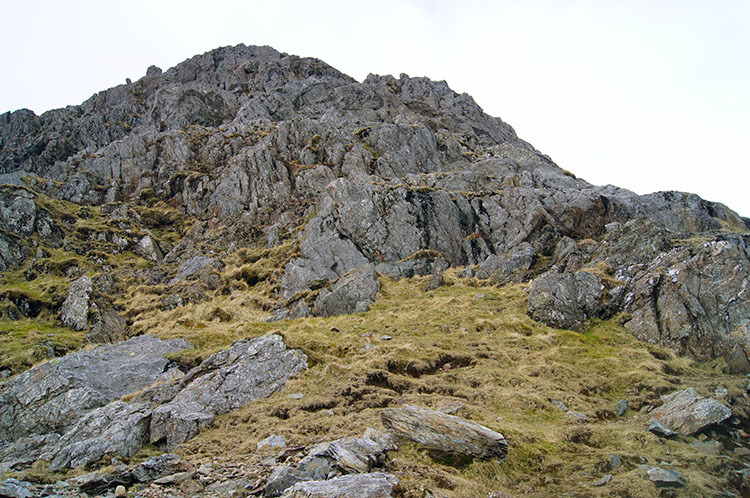 The Snowdonia National Park Authority describe Crib Goch as "not a mountain for the inexperienced". Well I can vouch for that. 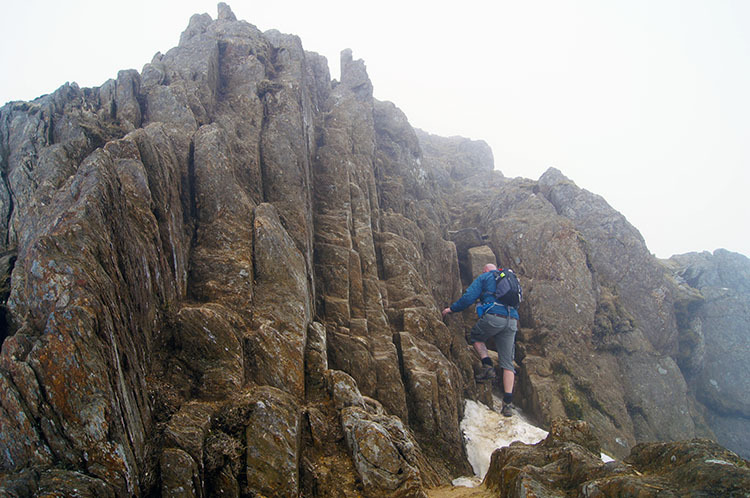 Even the experienced will find Crib Goch a challenge, particularly if it is for the first time. Fortunately I was with Adam but even he began the climb up the bad step by a method of trial and error. Sometimes he found a short scramble up to the next point first time and sometimes he did not, therefore having to climb down carefully before detecting another climbing point. I followed Adam's course of ascent for ten minutes and then decided to set off on my own. Like he did, I used a method of trial and error to work my way up the face of the barrier cliff that is the bad step. On a couple of occasions I had to step down or slide on my front to my previous step point because of an impossible course I would have come to further up. Just like rock climbing scrambling requires careful judgement at all times and an acceptance that there will be a lot of traversing. Despite the challenge though and the few hairy scary moments that ensued I have to say I was thoroughly enjoying the challenge. My adrenalin was definitely pumping as I scaled my way upwards. As I continued climbing and got to places with a little more visibility I kept an eye on Adam's progress. He was climbing just above me and to my left, making good and steady progress. 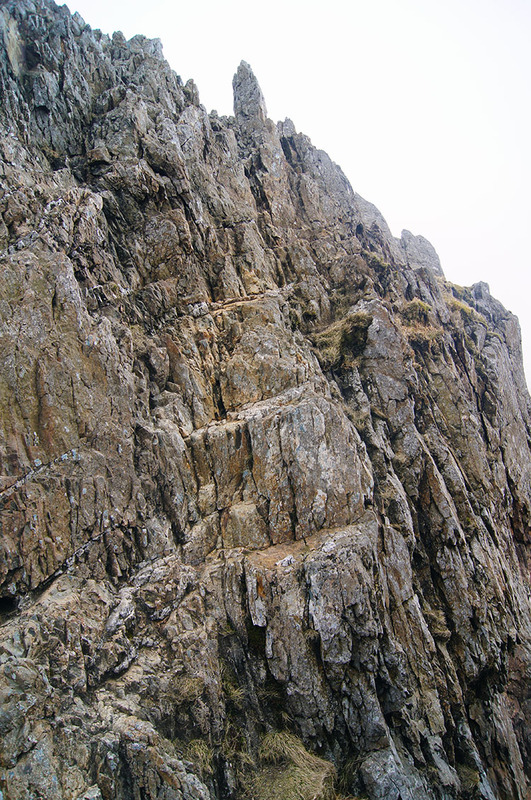 I was too and as further height was gained the bad step began to ease into a more even rocky scramble. 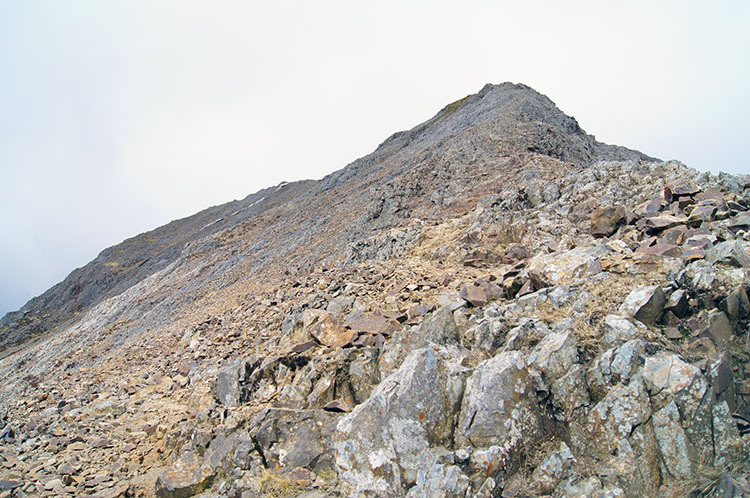 When I caught sight of the top of the eastern edge of Crib Goch's ridge I knew the hardest part was over. I scrambled up towards the ridge. While on the last bit of ascent scrambling to the Crib Goch ridge I looked over to the majestic sight of the ridge line connecting Y Lliwedd to Snowdon. Despite recent warm weather and being in the month of May there were still banks of snow clinging on to the north east facing slopes of the mountains. In fact, just two weeks previous heavy snow had fallen in Snowdonia and climbing Crib Goch would have been a much more serious proposition. Not sure I would even attempt it in the snow. Luckily for me it had thawed just in time for my arrival in Wales to walk down the country. Protruding outcrop. 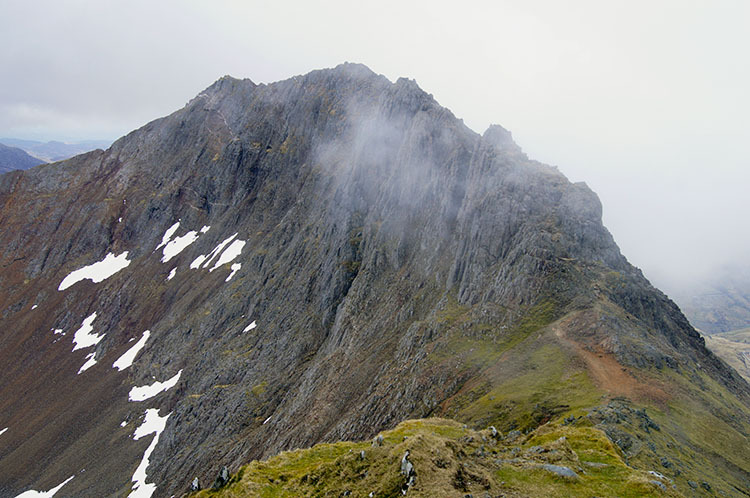 Is it the face of Crib Goch? Back to the climb up to the ridge and my accelerated pace saw me catch up with Adam. We were on the same line up to the top once more and so I kept in line just astern of him. On brief pauses I looked to the shape of the rock on the mountain. What I did note is that I could see no evidence of vegetation, the steep and exposed mountain being too austere for any attempts from plants to root. And as I gazed across the face of the mountain did I really see a face? Or was it a delusion? 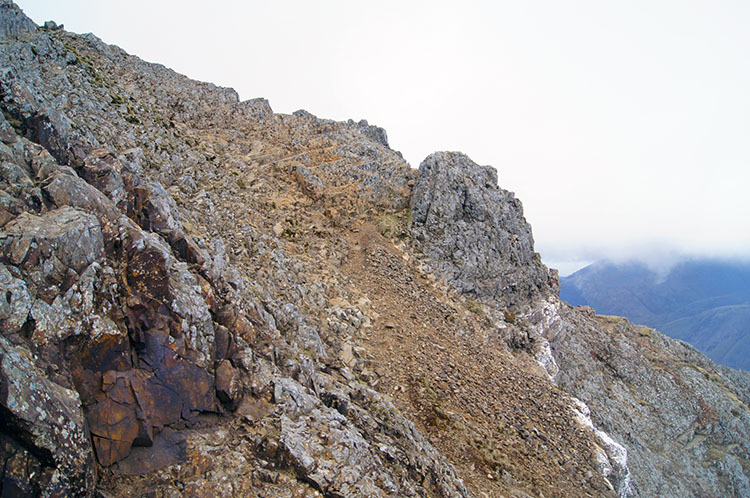 And then we were there, on the ridge at the far eastern end of the Crib Goch arete. 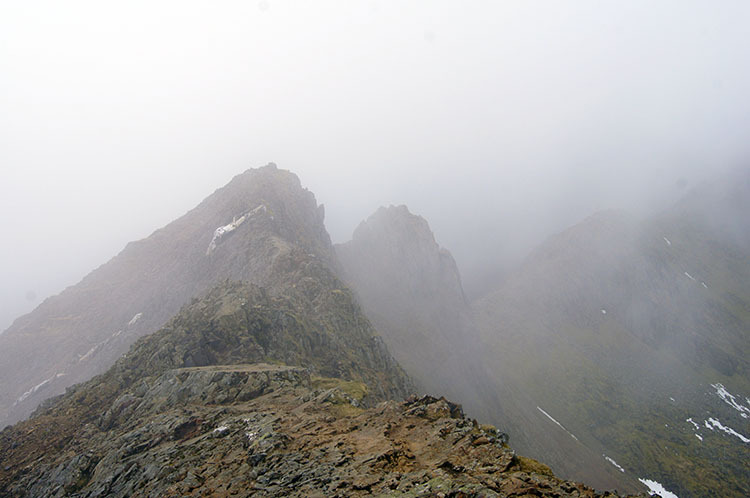 Cloud was beginning to interfere with our vision, certainly part restricting full views of the ridge but it was fleeting rather than permanent. We just had to wait and see. 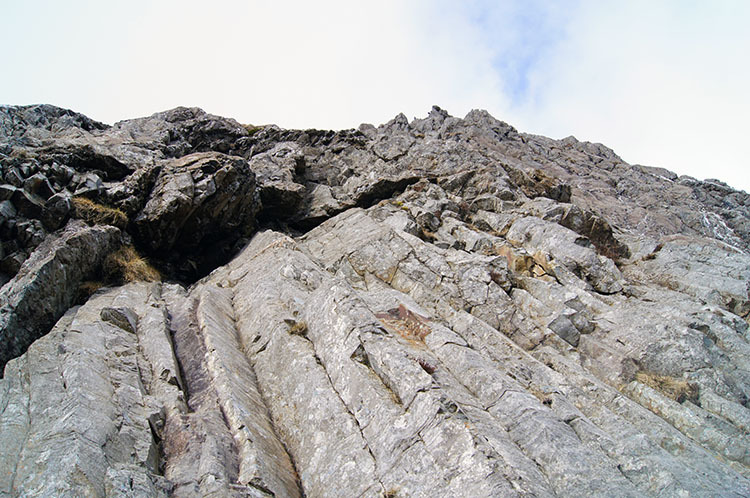 The first impression was of three rock pinnacles and as I looked I recalled a passage I had read in a feature on Crib Goch which informed me that this first part of the ridge is exposed with precipices below, having resulted in several fatalities, even of experienced mountaineers. Yes there were the pinnacles but I could not see any particular danger so I began to walk across the arete which I managed to do quite comfortably. Adam took a more hands on approach. 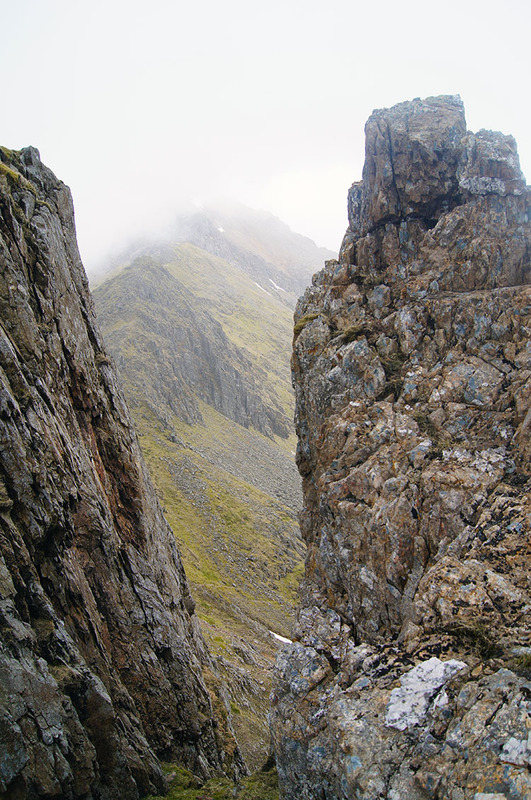 I continued to find crossing the arete to be an easy affair. I was full of confidence and not at all perturbed by the top line, including the pinnacles. 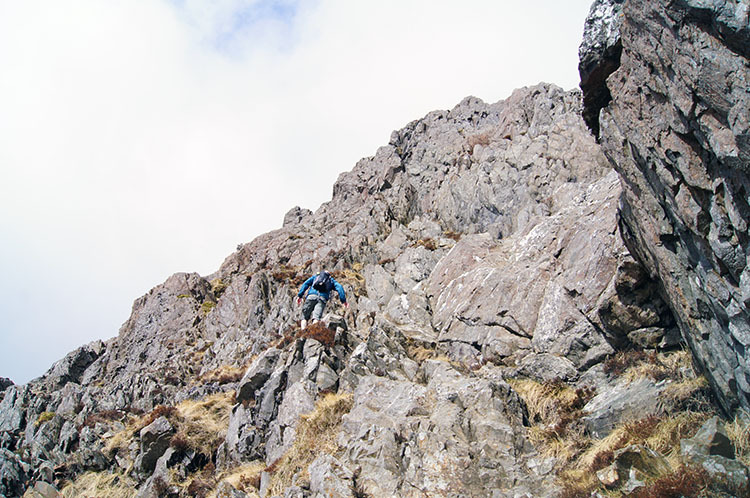 On a couple of occasions I stepped off the top to scramble around, even I am not going to stand up and walk across knife edge sections of aretes. We were fortunate to have little wind to content with which really helped. 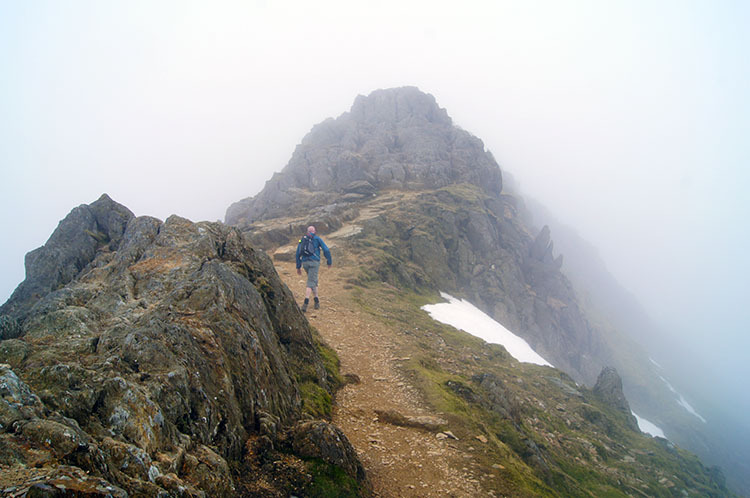 With the calm conditions and the frequent parting of the cloud I continued across Crib Goch. Adam continued to follow on by keeping to his hands on method. The third pinnacle on Crib Goch gave way to a break in the ridge which took Adam and I down to a grassy col at Bwlch Coch. Here plant life did hold on to a place on the mountain, a section of hardy grass protected by the pinnacles around it. From the col it was straight back up though to the ridge once more, but by now we were well on our way to completing the Crib Goch crossing and heading towards Garnedd Ugain. The section of walking from Bwlch Coch to Garnedd Ugain was a series of level sections followed by the crossing or rounding of impressive rock pinnacles. 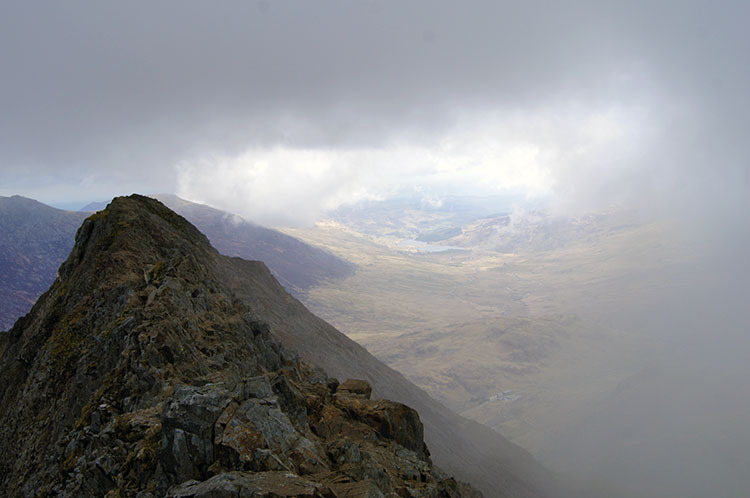 The first one we climbed gave us a spectacular view of the Crib Goch arete we had just crossed. It was a lovely feeling to look back and reflect on a brilliant walk across the top ridge. I was chuffed with myself. More grassed areas were now becoming evident on the slighter slopes and more sheltered parts of the mountain. The grass ceased to attempt placement though when it abutted the rock pinnacles, some of them almost vertical. We crossed over yet another but its west side was much less formidable than its east side. We simple took a couple of steps off it onto an elevated path. And as we stepped onto the path I relaxed from all the exertions and excitement. I should have stayed tense. After recovering from the painful experience Adam and I continued along the path towards the trig point on Garnedd Ugain at Crib y Ddysgl. Then we carried on walking towards the summit of Mount Snowdon. 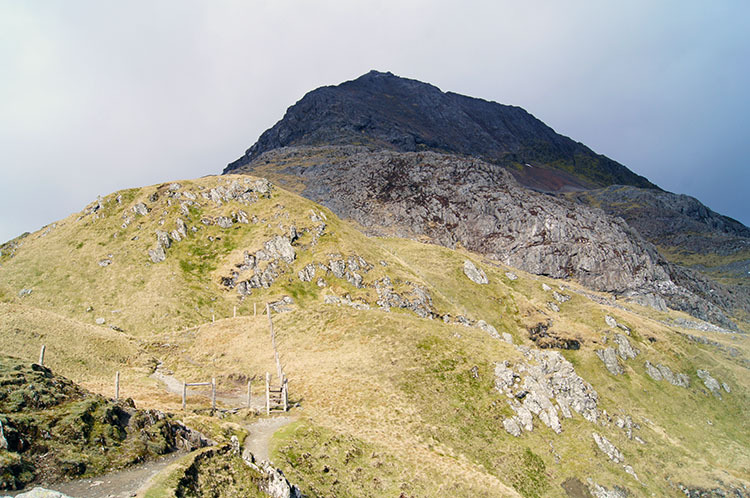 At Bwlch Glas, the point where a number of paths meet, we came across other walkers for the first time since leaving Pen Y Pass which was remarkable as Crib Goch can get very busy. On this occasion when were were on Crib Goch we were the only ones, a very rare occurrence. 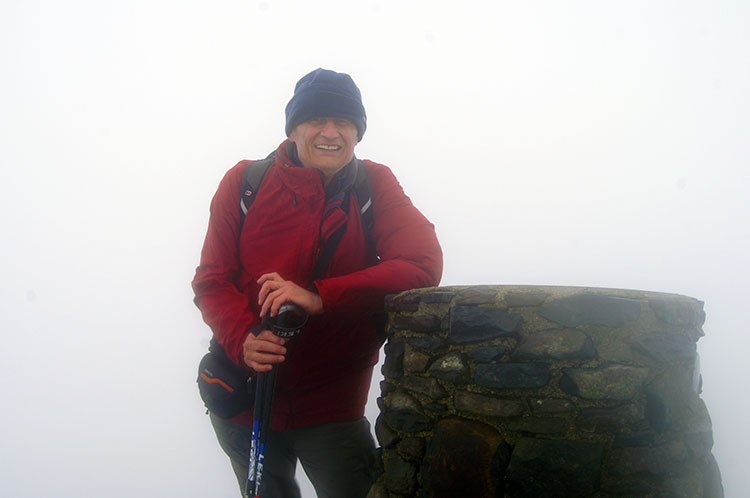 You may recall I hoped for clear conditions on top of Snowdon. My hopes were dashed. Just as had happened on my last visit 11 years earlier, cloud was clinging to the top of the mountain. 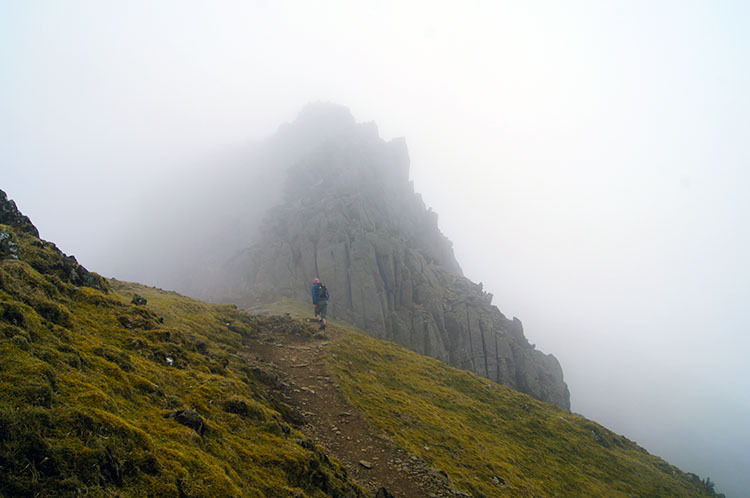 Thick cloud this time, not like the thin veils of cloud which kept a moody presence at times during our crossing of Crib Goch. No, this was indeed thick cloud and in the white fog it was cold. Really really cold. So after tapping the top stone and taking the photographs Adam and I sought immediate shelter by getting off the top. 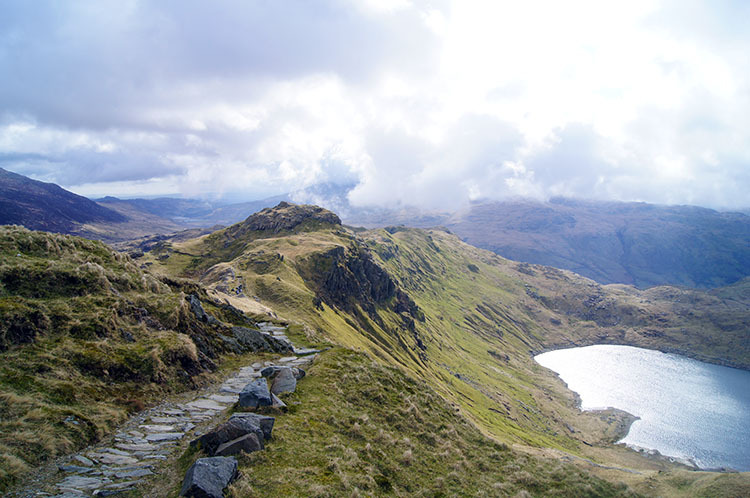 After a laugh by completely circling the cafe building on the top of the mountain we found the Watkin Path, our means of progress off the mountain, and started our descent. After about 100 metres of descent we were out of the cloud. 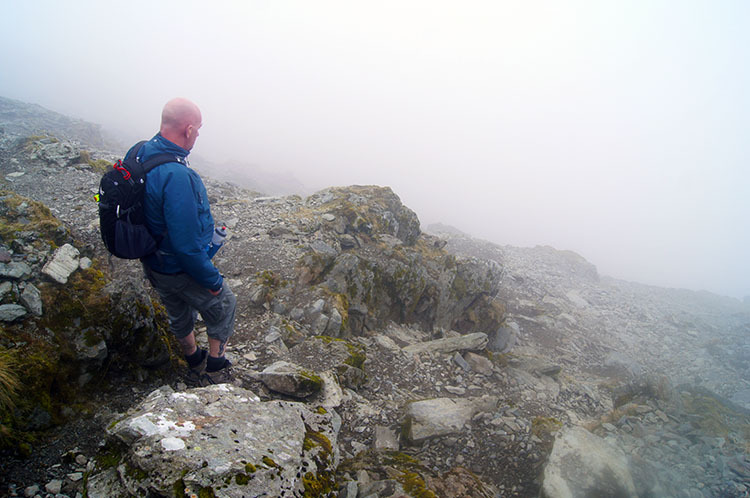 I mused "Will I ever get a view from the summit of Snowdon?" Perhaps not as I have no plans for returning in a hurry. More mountains to discover you know... 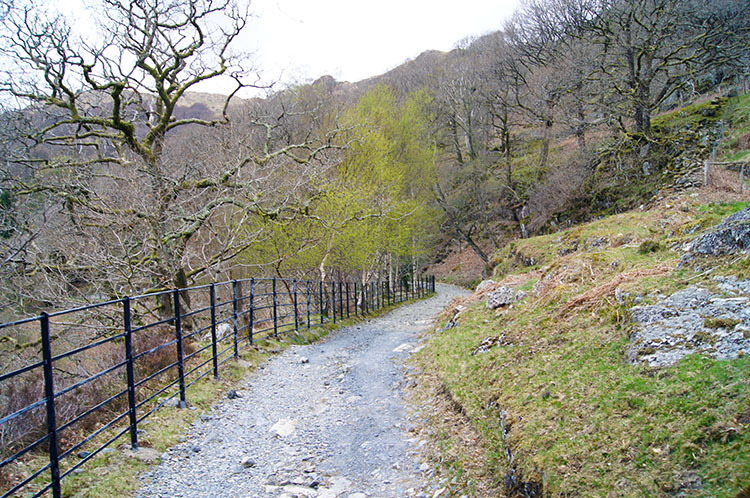 The Watkin Path proved to be a lovely way to leave Snowdon behind. The view of the West Peak of Y Lliwedd drew us towards it and had we maintained our course we could have crossed it to continue on the Snowdon Horseshoe but at Bwlch Ciliau we parted from the route of the Horseshoe and continued down the Watkin Path. If you are doing the horseshoe then "see you and good luck". Further down the Watkin Path Adam and I came to the site of a disused slate quarry. 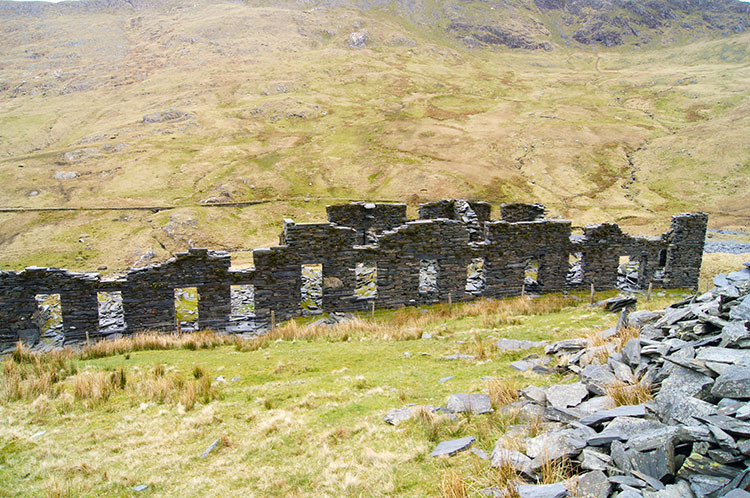 Some piles of slate were still neatly standing and the eerie shells of the quarry buildings still in place too. 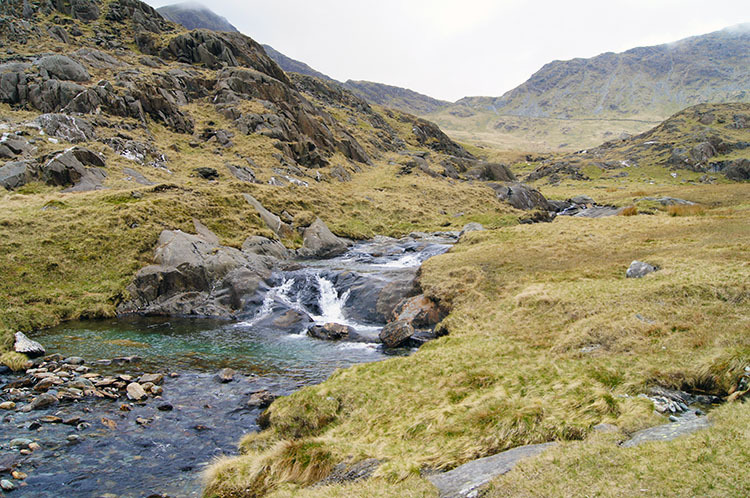 we walked on past the quarry and the buildings by following Afon Cwm Llan downstream. Soon after passing the site of the old quarry we came to the site of present day works with a digger working on a trench to lay large plastic water pipes. A sign told us the work was on a National Trust hydro-electricity project which when completed would provide all the National Trust's electricity needs in Wales. 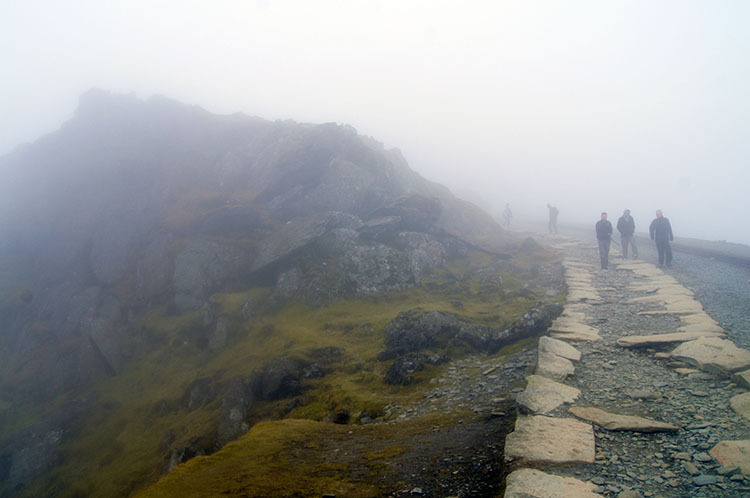 The site of the works was near to Gladstone Rock where William Gladstone, the Victorian Prime Minister officially opened the Watkin Path in 1892 on behalf of Sir Edward Watkin, a railway tycoon who owned a cottage in Nantgwynant and who designed the path to the summit of Snowdon. I guess both Gladstone and Watkin would approve of the National Trust's methods. Immediately after passing the National Trust's works at Plascwmllan Adam pointed out an alternative track, not used, which he suggested was the route of an old roman road. It looked straight enough to be one. I followed him down the ancient route thus doing the diameter of a semi circle rather than the longer circumference. From Plascwmllan we followed the Watkin Track down to its conclusion at Nantgwynant where the aforementioned Sir Edward Watkin once lived. And then after walking a few yards along the road to the hamlet of Bethania this walk was done. 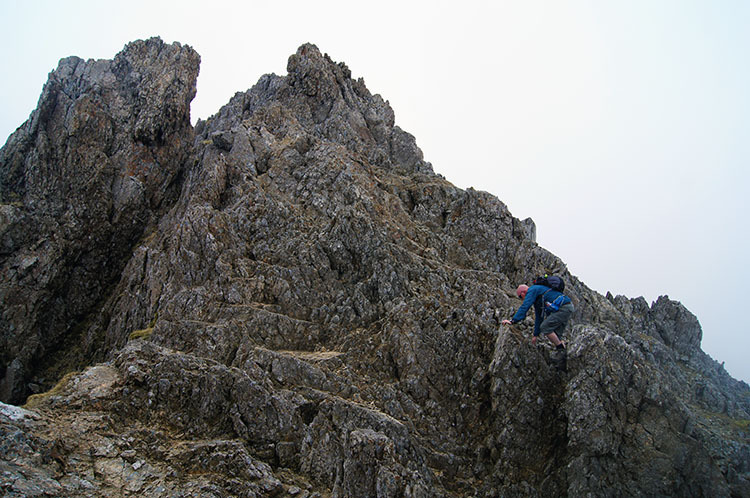 I had accomplished Crib goch at last, thanks to the sterling support offered by Adam of course. I had more miles to go on my Welsh journey. 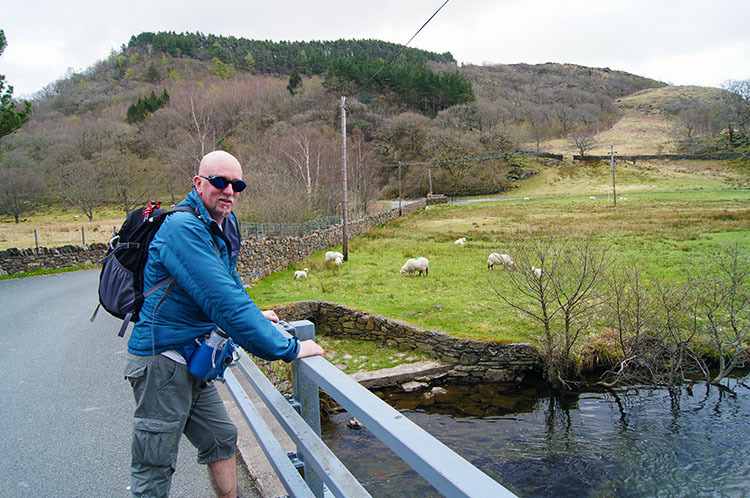 Indeed Adam and I continued on to Beddgelert but for the convenience of a Snowdon crossing you could leave a car at Bethania before getting over to Pen Y Pass. It's an ideal spot to do so.